One never truly knows what they’re going to get with a Silent Hill game. Possibly terrible controls, choppy animation and not enough frakin’ ammo totalling massive frustration and yet another controller left in pieces after it all. Needless to say I was weary at first when purchasing this puppy. Enter the next-gen mentality and hope for change. Is it worth it? Let me put some minds to rest still contemplating, yes its worth it. Especially since you can now pick this title for around 40 buck or less. 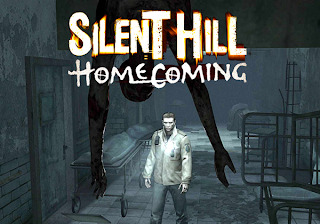 The game starts you off in one of the original Silent Hill towns. You return as a lone soldier boy looking for your lil bro. In typical SH fashion, the towns is almost deserted except for the few townsfolk you’ll need to interact with here and there critical for the storyline to move forward. Decent plot and shear eeriness should keep your interest from the title screen on. I particularly love how the game starts off graphically like some old school horror flick with the scratchy camera screen that flickers, etc. Some reviewers fault the game for moving too slow until midway in the game, but I disagree. It’s a good pace in my opinion and actually picks up well midway as the action intensifies. Above average graphics in my opinion (face modelling, etc. ), but then again its the one thing Konami always got right (next to the rendering Gods, Capcom). I’m huge on calling out games that have bad physics engines (you know, the whole walking through a person/objects ala WWE games), luckily the physic dynamics are sound. If you brush an object..say a floor lamp, it will fall over. Yes, its the lil’ things. There is little to no soundtrack until enemies appears on screen to battle, otherwise the sounds are as expected in full on 5.1 surround. Love it. Especially when your in the sewers under the city. You hear everything. My only fault with SH: Homecoming is the difficulty against certain enemies. Pretty much any enemy from the beginning can kill you and quickly with just 2-3 hits. Learn how to dodge effectively and counter-attack or you won’t get beyond chapter 1. Trust me. Conserve your ammo for harder to kill creatures, using the shovel or bat to kill others. Though I have to admit there were times while playing this I became utterly frustrated at some battles. I got through them after taking a break and just planning out my strategy of attack. TIMING IS EVERYTHING. – Acceptable plot if you’re new to the series, or not. – Good balance of action and mild horror suspense. – Worth the reduced price you can find this for now. – Fighting mechanics are way better than any other previous SH title. Still needs work. – At times can be difficult to know what to do next. Be warned.